I liked the overall shape in the drawing but not the placement of the insets, so I decided to go for some padding and quilting at the knees instead. I traced the quilting lines from another Burda pattern, 106-03-2013. Unfortunately I did it very slightly too high up the leg and the padding I used was a bit thin: just a layer of boiled wool left over from another project, backed with cotton. As a practical feature it just about works – I was very grateful for the padding when I found myself having to kneel down on a concrete floor to reach something at work recently – but it would work a lot better if it was a few centimetres lower. The sizing is off because I’ve increased in circumference this year and the last two pairs of Burda trousers I made came up much too small. Determined not to make the same mistake with these I measured myself and decided to cut a size and a half larger than normal. I did not think to measure the pattern. I may have cut too generously, or perhaps there’s more ease in the pattern than one might expect from trousers described as ‘skin-tight down to the ankle’; of course they are much too large. It’s not all bad though. It might look sunny but was extremely cold when we took these and I was able to get two layers – tights and leggings – on under them. But yeah, look at those wrinkles. Skin tight they are not. 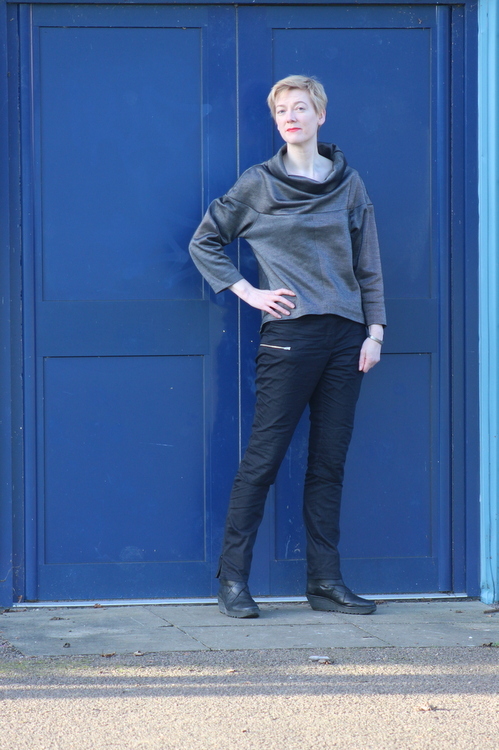 I also added less length than I usually do, because Burda trousers always seem to turn out longer than I expect. This was the ‘correct’ decision because objectively on me they are exactly the length the pattern is intended to be, but I want them to be longer! I normally wear them tucked into knee boots because they feel too short. Although it may sound like these are a complete failure they’re not. I made them a couple of months ago and have worn them about once a week, mostly at work. And denim trousers usually get better with age. 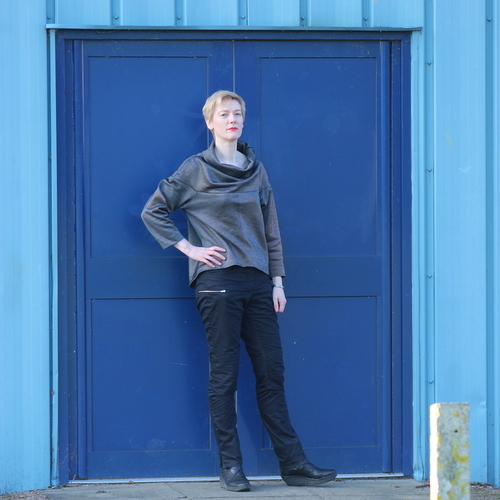 Posted on January 17, 2016 January 16, 2016 by catherinedaze	This entry was posted in black, burda, dressmaking, Finished, sewing, trousers and tagged black, burda, dressmaking, sewing, trousers. Bookmark the permalink. They look great, though! Love the silver zip. i’ve always wanted a pair of trousers like those, but I could never pull it off. What’s the shirt, by the way? Thanks! The top is another Burda: 109-10-2015. I quite like that pattern! I understand what you are saying about the fit, but I’m glad you are getting wear out of them – they look quite acceptable. I’ll have to see if I have this issue. Too bad the fit didn’t work out the way you wanted – but the style looks cool though! And at least they are getting a lot of wear. I have these pants and the top your wearing on my to sew list. Even though yours came out large they still look good. I love your style. These are a great pair of jeans, despite what you don’t like about the fit. If you’re wearing them, that’s good! They look great with your top, too. I think this might be a case where if you weren’t posting them as a make and just had them on, I wouldn’t even notice any of the things you are saying about the fit. I’m glad you are getting wear out of them even though they aren’t exactly as you imagined. They really do look cool. They look good and fit rather well (if you don’t know the intention). Love the knee quilting, great idea to use the other pattern for them. I think they’re pretty cool. Love the details you add to your garments. Nothing Burda calls skinny every turns out that way, I find. These look great, just not like the beige, green, purple ‘space’ lady they showed in the mag. (Which would have suited you also! The whole outfit!) Glad to know these turned out useful in any case. Yes, there are very few truly skinny jeans patterns out there. I’m hopeful for the toreador trousers in the latest issue though – but alas no pockets. I likoe what you guys are upp too. Such clever work and coverage!